Service. Service. Service. If location is everything in real estate, then service is everything in business. 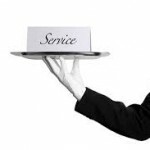 Everyone promises the best or fastest service and in some cases it is easily measured and delivered. In other cases it isn’t so easy. In the case of motivating sales people, one of the companies I represent has figured this out in spades and it’s a wonder that more companies don’t take this approach. I guess that’s part of the reason I am writing–the world would be a better place if more businesses truly focused on service. What is this magic plan for motivated sales people who put service to their customers above the quick fix of a sales dollar? Here it is: incent your sales people towards service not sales. But you need sales right? We all know it cost more to get a customer than to keep one right? Service to our existing customers is the best way to grow our businesses. Higher Standards is the company that does this so well. In the industry of merchant services where the attrition rate nears 50% for many companies, Higher Standards has an attrition rate of only 5%. You don’t have wax in your ears, only 5%! Here’s what they do differently. Most companies in the business of merchant services pay their sales folks a commission for the sale. Higher Standards doesn’t pay a commission to their reps upfront at the time of the sale, but rather pays a small residual over time. So where is the focus of the Higher Standards rep? On keeping the customer for the long haul. Might that rep be more interested in developing a relationship and taking care of their customer by providing service–you know the answer! If your business has sales people, consider how you might motivate them towards the activity that benefits you in the long run. Take care of your customers and the sales will take care of themselves. Whichever avenue you decide to take, just remember that if you make customer service a priority, then you will not only sleep well at night but you’ll also have satisfied customers that pass your link on to their friends and family.